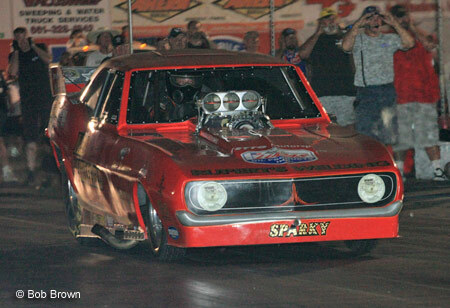 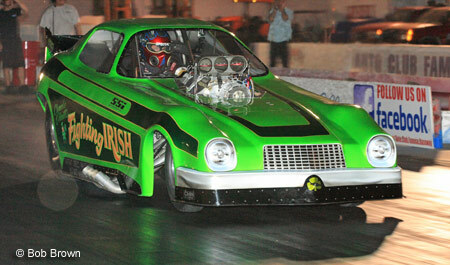 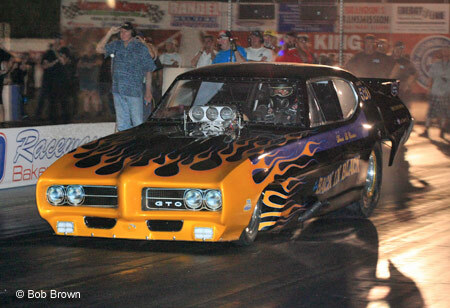 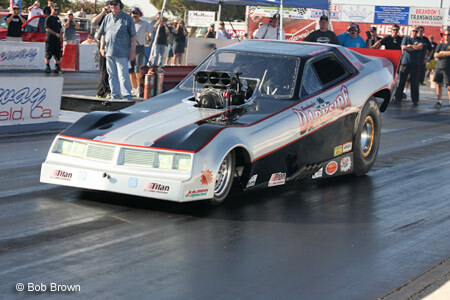 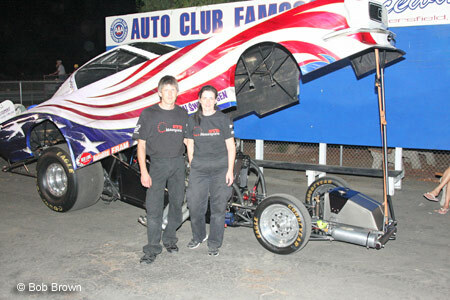 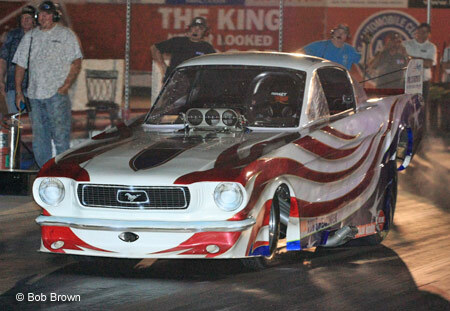 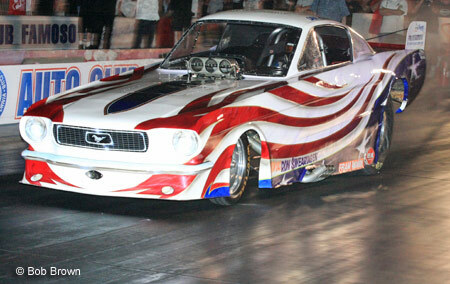 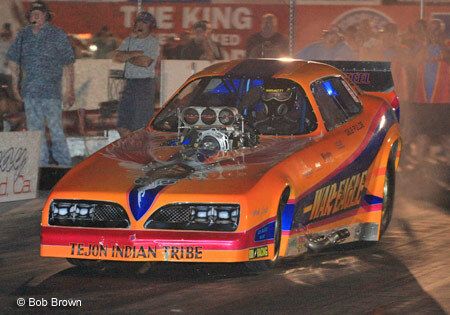 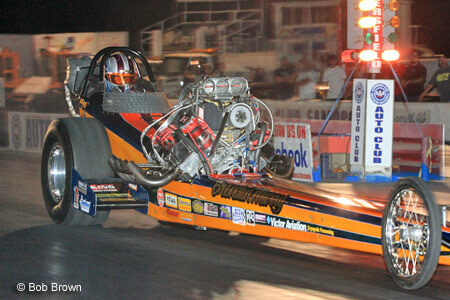 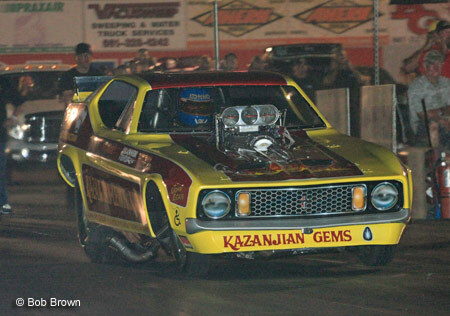 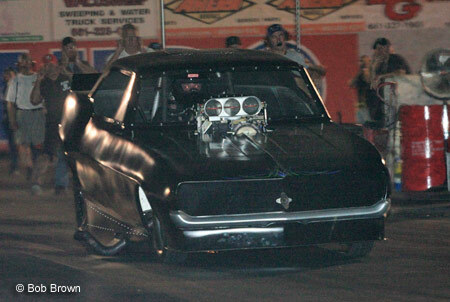 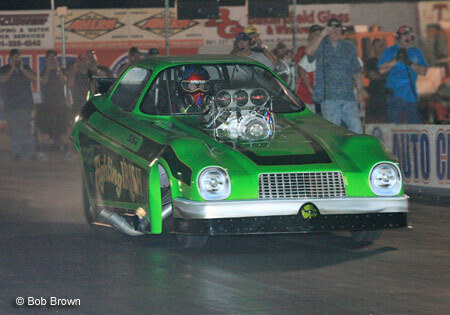 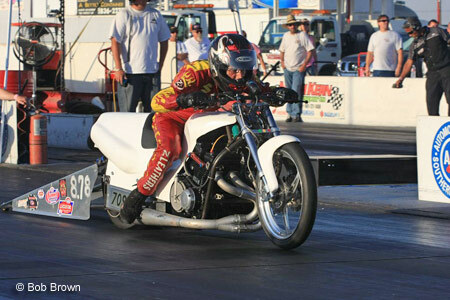 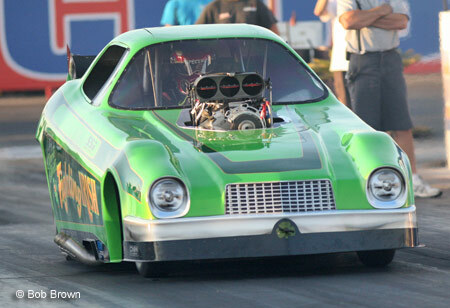 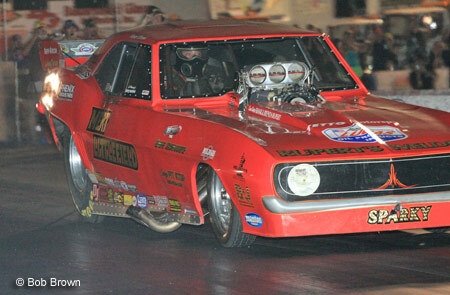 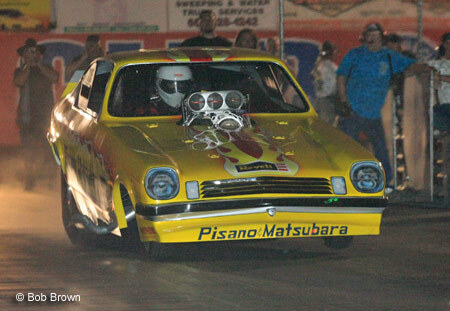 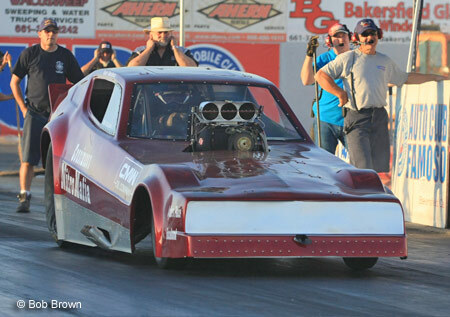 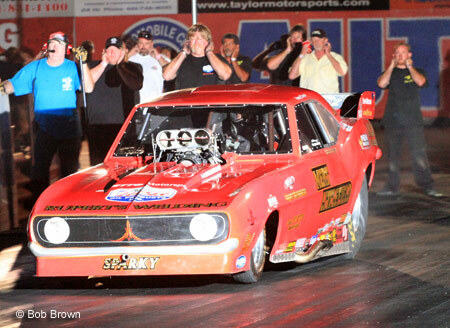 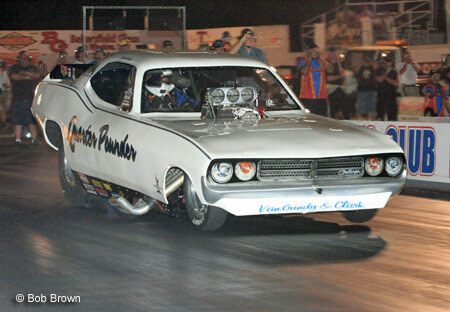 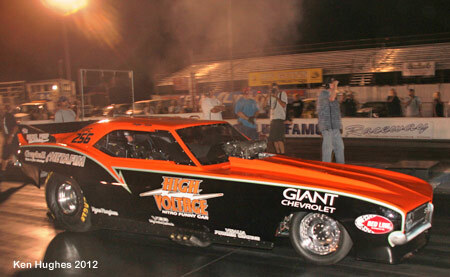 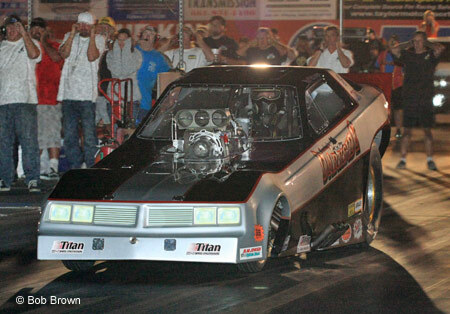 Event report by Bob Brown: The last of the three Saturday Night Nitro events held at Famoso over the Summer took place on Friday and Saturday, Sept. 7-8, 2012. 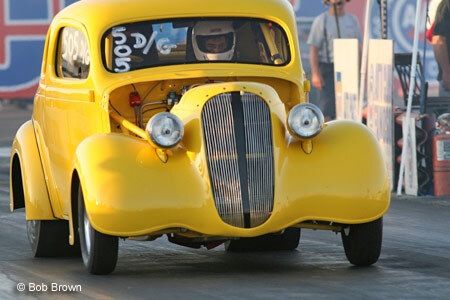 Gates opened Friday to fuel cars after lunch, with other classes coming through the gates after 5PM. 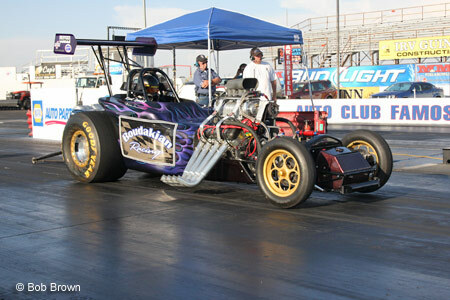 On Friday afternoon, Dan Horan Sr.'s dragster was the sole TF car on the premises, with a handful of Nitro FC's on hand sprinkled throughout the pits. 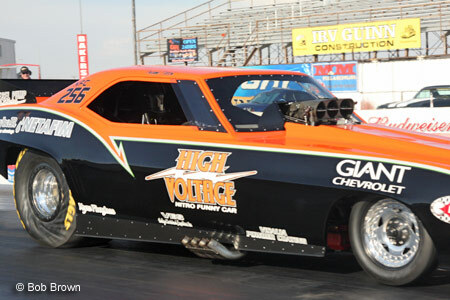 Friday evening was test and tune time, with several fuel cars doing licensing passes for new prospective drivers and others looking for a baseline for Saturday night's competition. 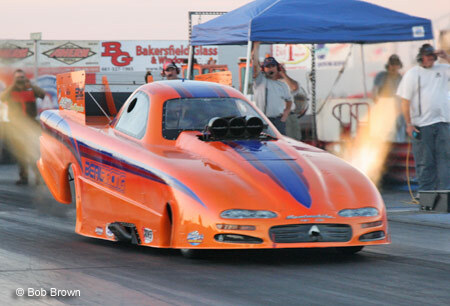 Temps were in the high 90's, cooling after sundown to make for a balmy evening of racing. 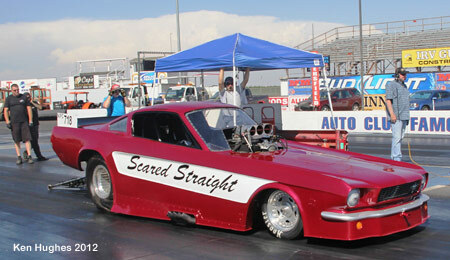 Several FC's were in the low 6's, but Dan Horan Jr. laid down the law with a nice 5.85 right off the trailer. 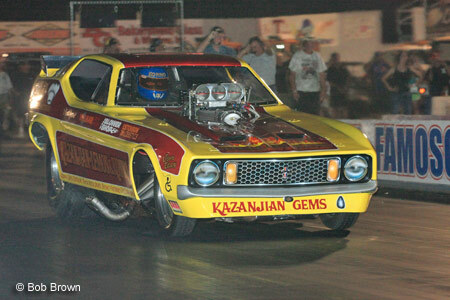 He also did a shakedown squirt in Dan Sr.'s digger that night. 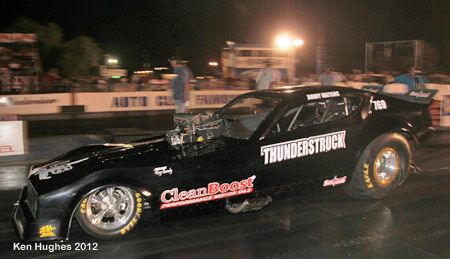 Saturday brought out Bob Richardson's Circuit Breaker, along with Brendan Murry's car in the T/F group. 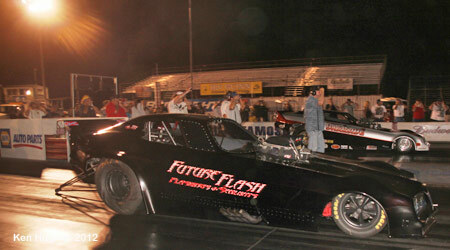 Nitro FC's came in droves, and by Saturday evening, there were over 20 competing for the Winner's Circle. 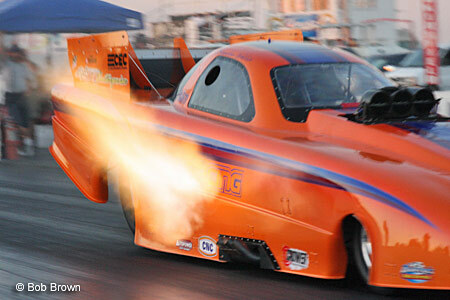 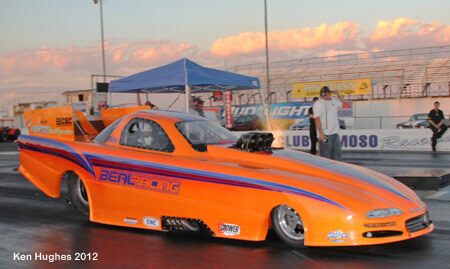 The Beal Big Show FC did some license passes too, throwing out some nice flames at dusk. 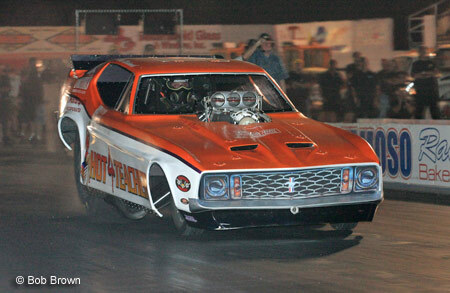 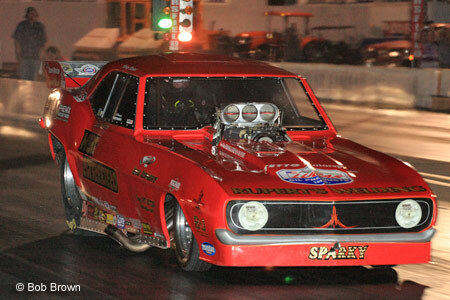 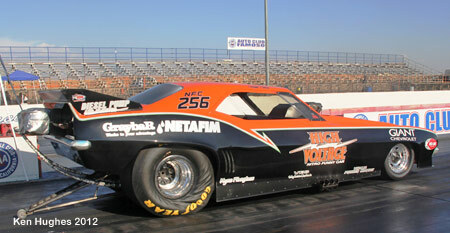 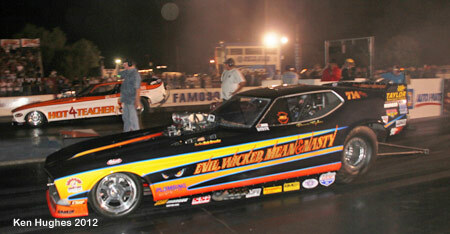 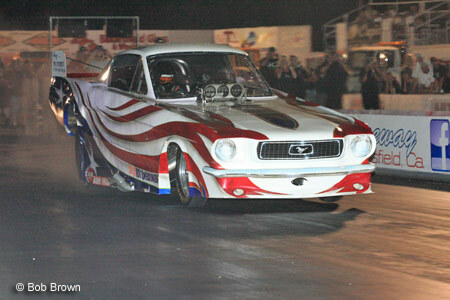 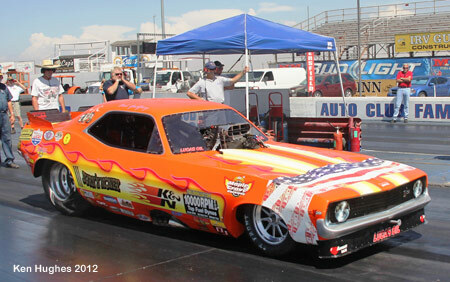 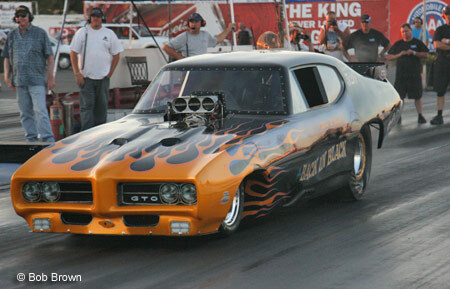 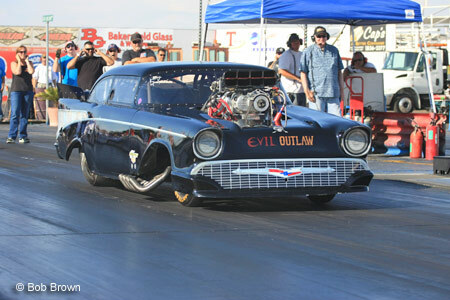 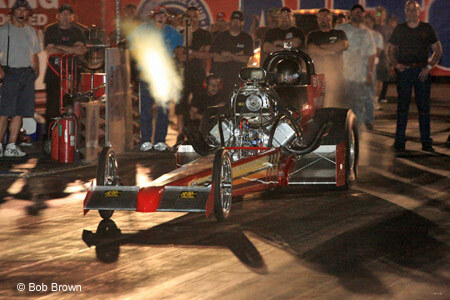 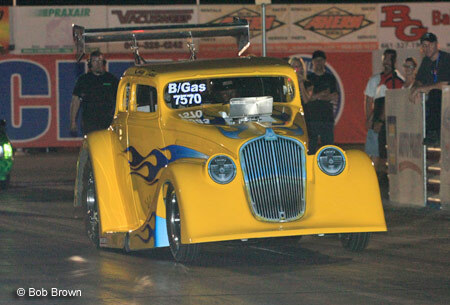 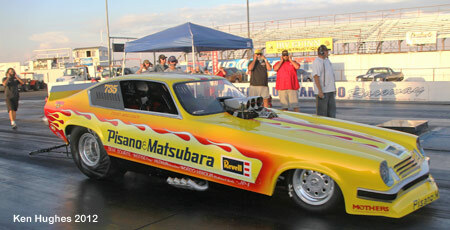 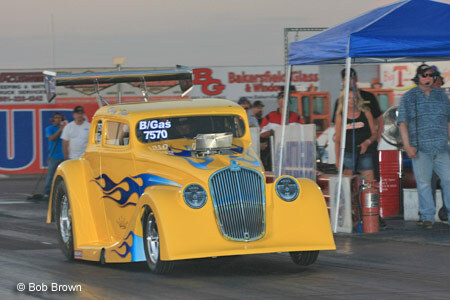 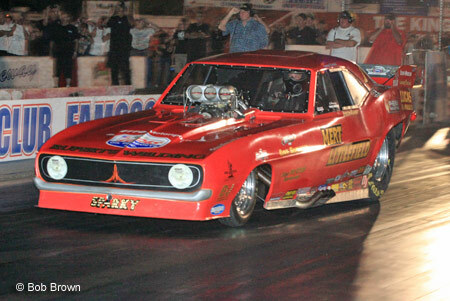 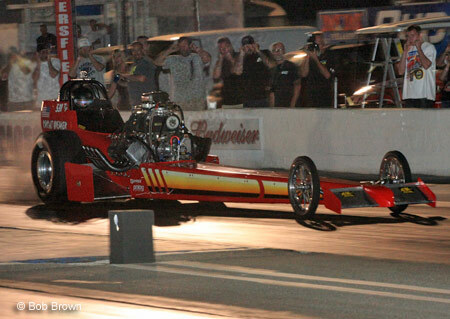 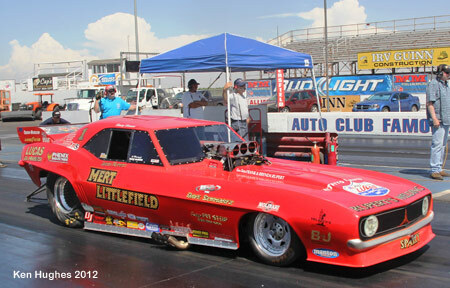 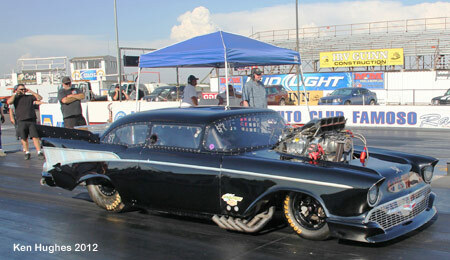 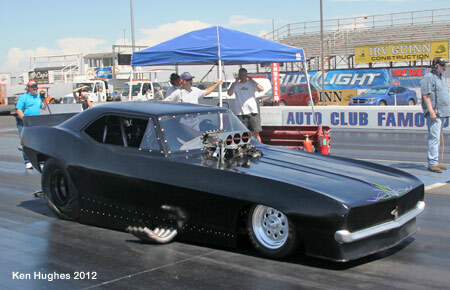 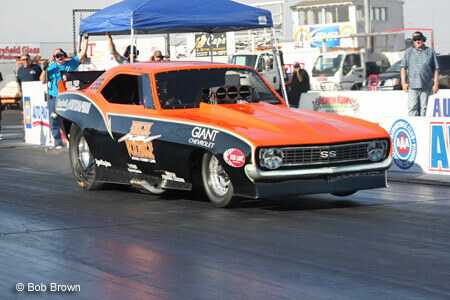 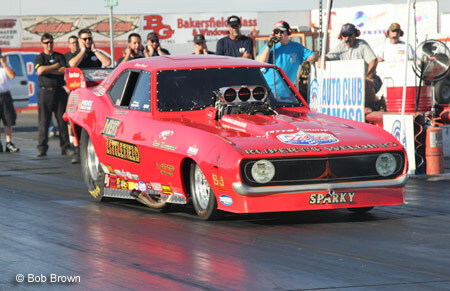 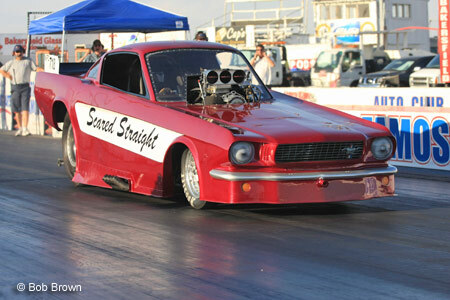 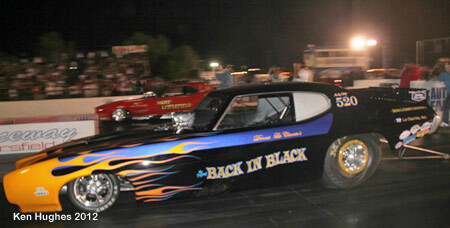 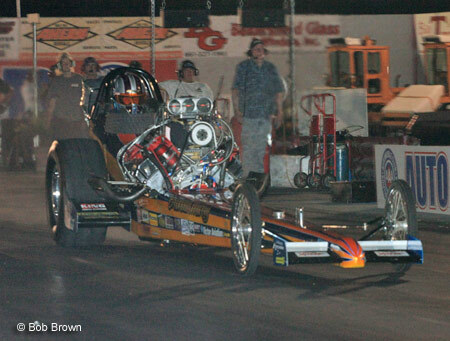 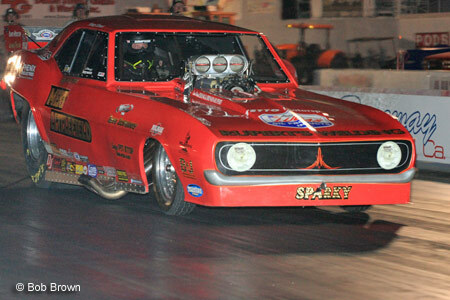 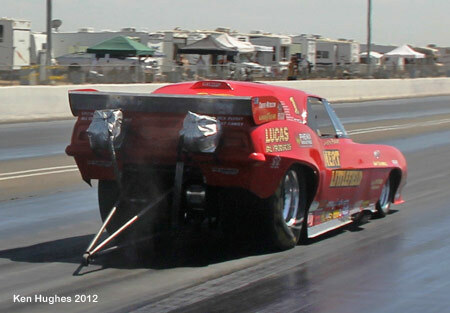 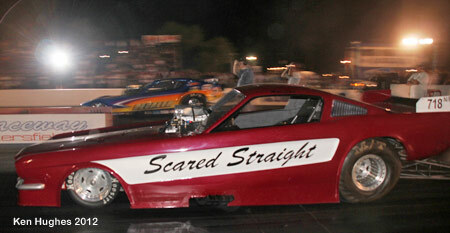 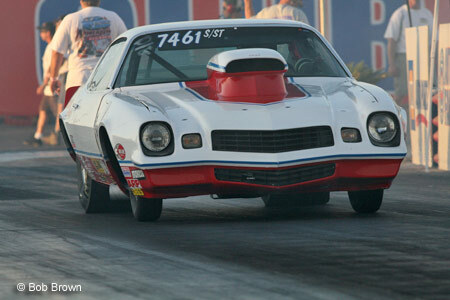 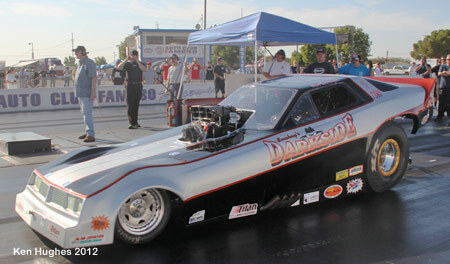 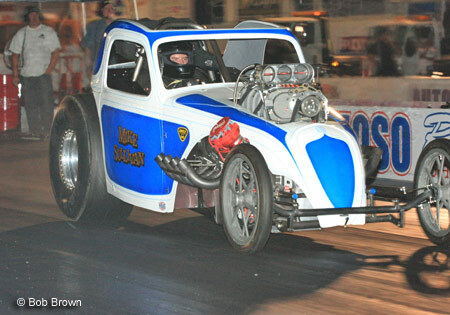 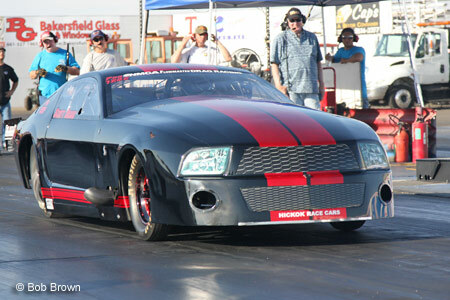 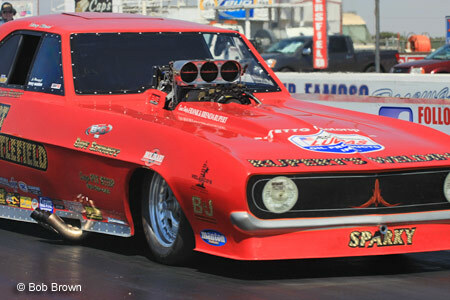 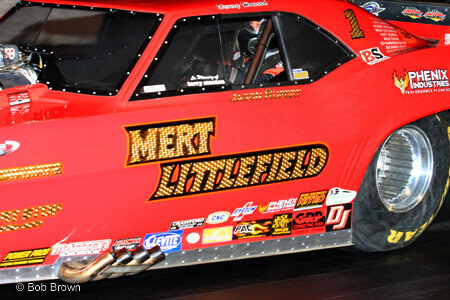 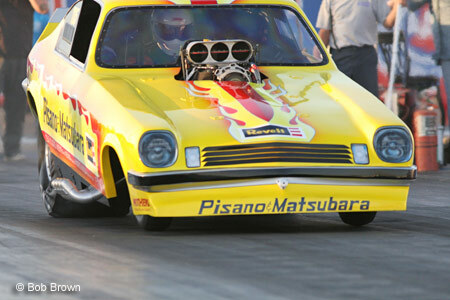 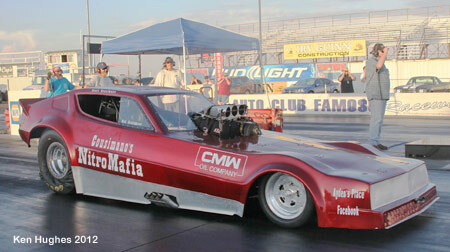 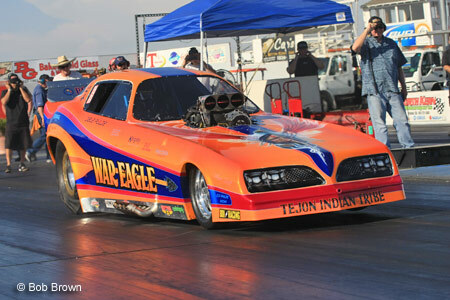 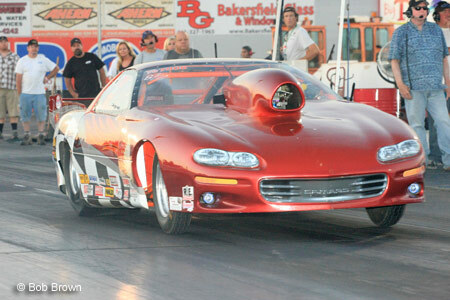 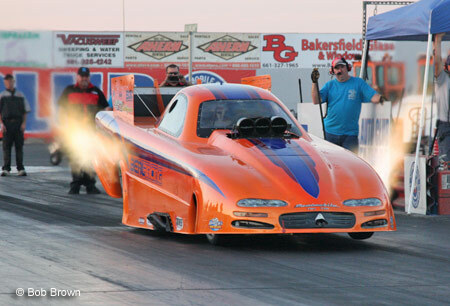 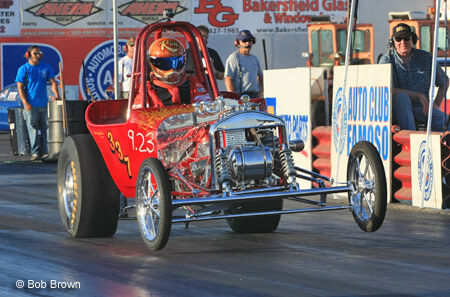 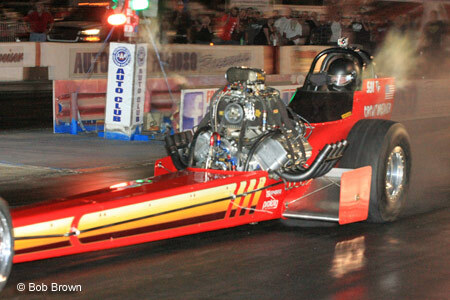 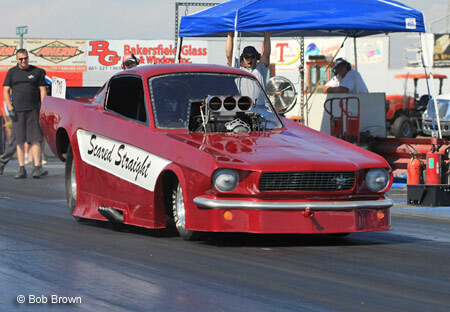 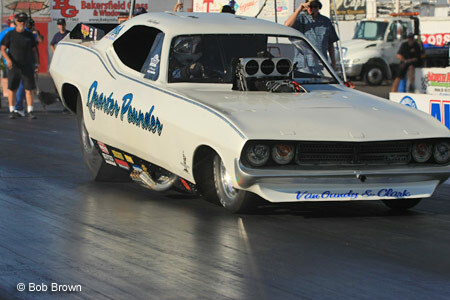 The West Coast Hot Rod Association ran their competition on both days concurrently with the Nitro cars. 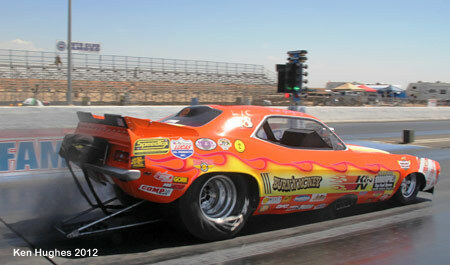 A variety of classes began at 1PM Saturday and seldom let up til the wee hours of Sunday morning. 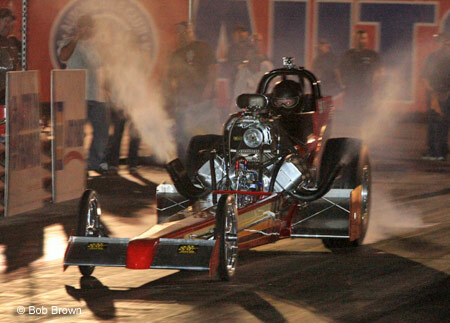 The nitro cars were slated to compete at 8 and 10 PM on Saturday, a change from the previous month where they also ran at midnight. 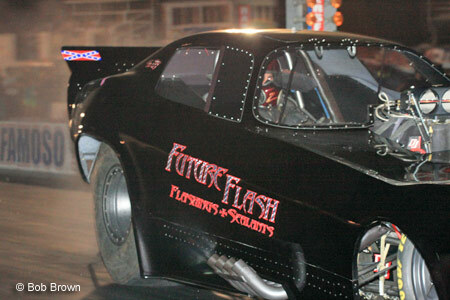 It was thought that this would make it easier for more spectators (read families) to witness the finals without having to stay out too late. 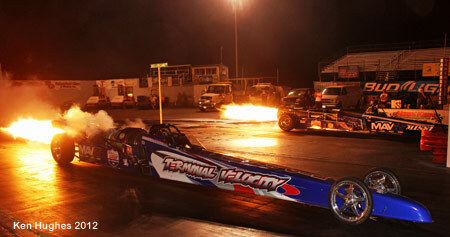 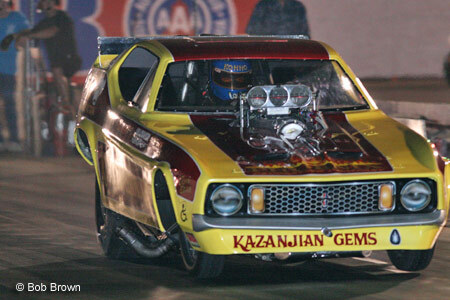 Special appearances were made by a pair of jet cars and a pair of nitro burning Harleys. 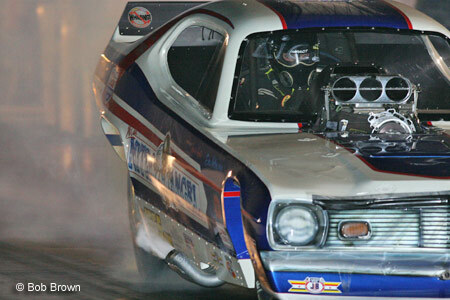 Huevos grandes all around! 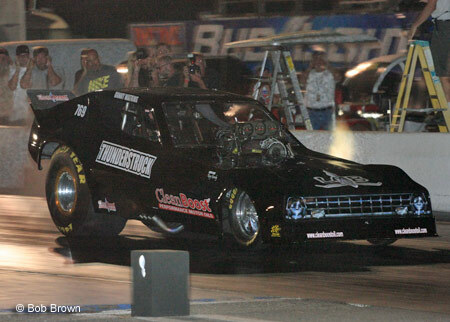 Frank McBee had triple duty this weekend, serving as a crew member on Brendan Murry's Running Wild T/F digger while also doing two license passes in the same car on Friday. 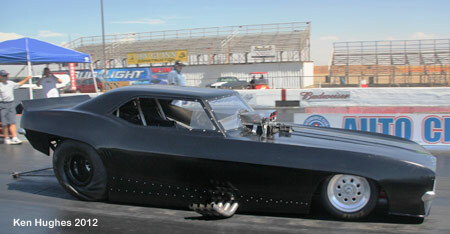 Then on Saturday, Frank assumed driving duties in the Archibald A/F blown alky BBC car. 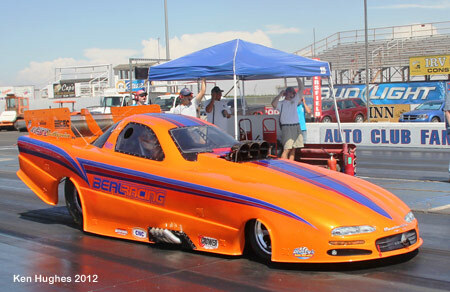 A planned 4 car A/F match race turned into a 3-way event between Jerry Kumre, Kin Bates and McBee in the Archibald machine. 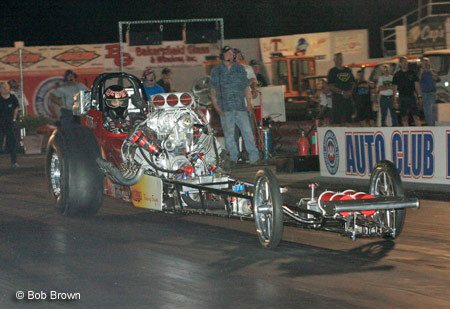 The final was Bates vs. McBee, with Doc Bates taking the win in a close race. 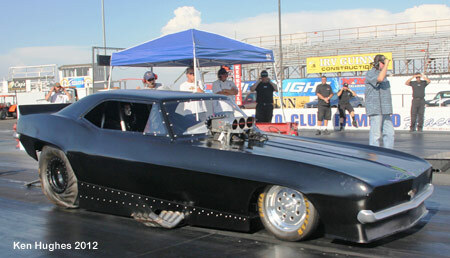 Funny Car competition did an "all run" first round, with the eight best winning ET's running in the second round. 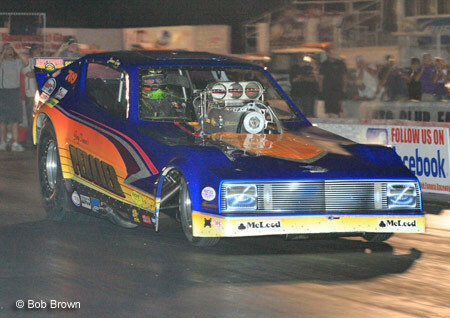 Best winning ET of those four pairs took the Wally. 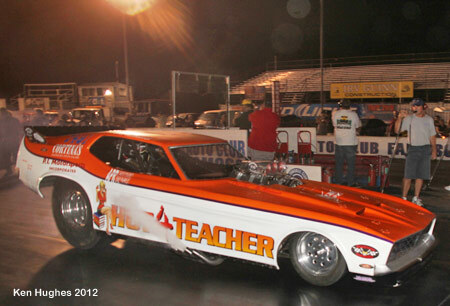 In the second round, the third pairing saw Dan Horan Jr. face Alex Milodinovich in the Hot-4-Teacher car. 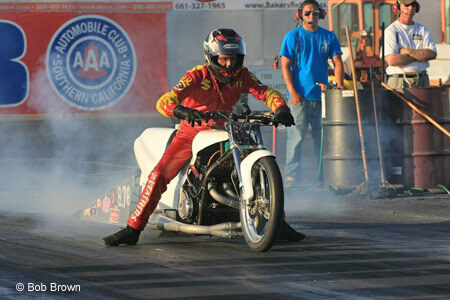 After the burnout, Alex couldn't engage the reverser or the forward gears. 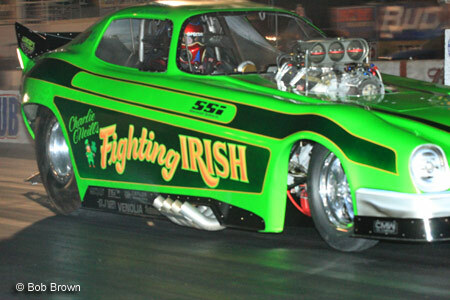 Track staff tried to assist by a hand push, but time was running with heat building, so Alex sat in the car downtrack while Horan made a laser-straight pass by him, netting a 5.75 at 253mph as everyone breathed a sigh of relief! 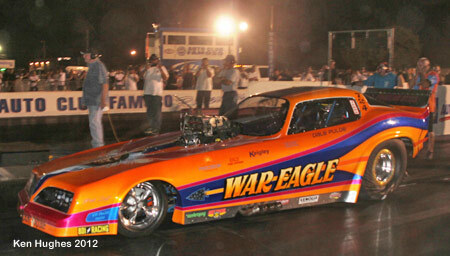 This was low ET for the event, giving Dan Jr. the Wally. 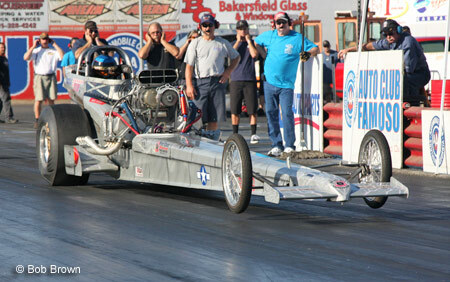 James Day in the Pedaler (last month's champ) had second best ET at 5.86. 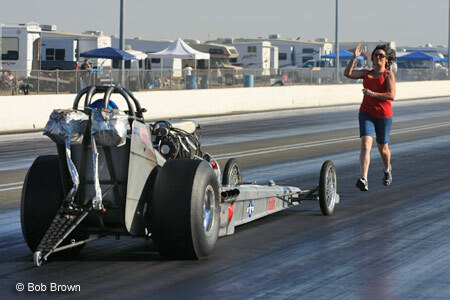 Here's some photos not in chronological order. 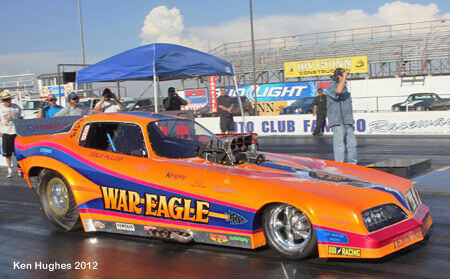 This was an alky altered. 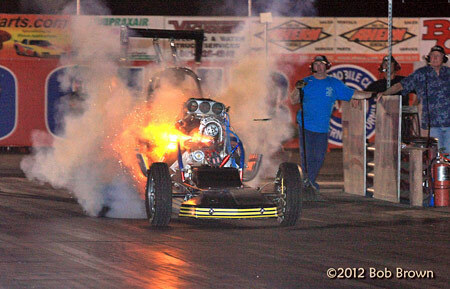 Burnout was fine... staged, and at the hit, KAPOW! 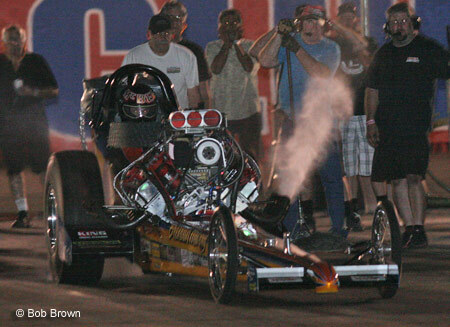 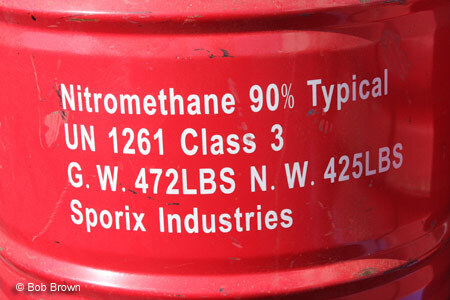 The straps held it in place but it looked like the gasket material between the manifold and blower had exploded outwards. 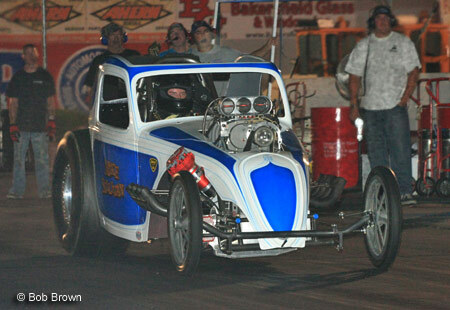 This is Brendan Murry in the seat of his Running Wild Racing TF car. 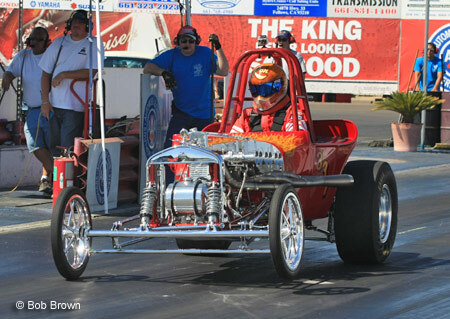 Same car, different driver. 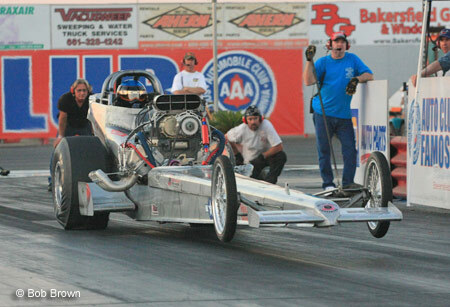 Murry's crew chief Frank McBee was making steps to upgrade his licence. 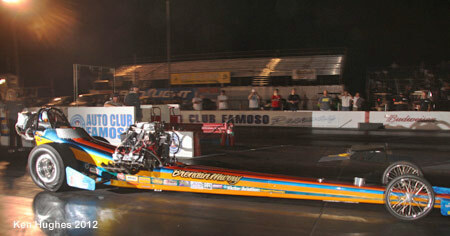 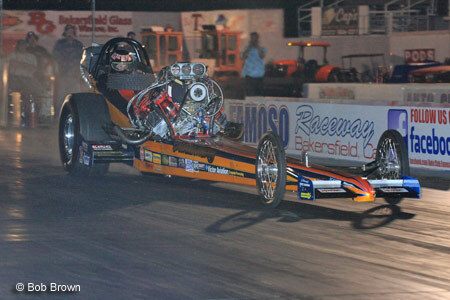 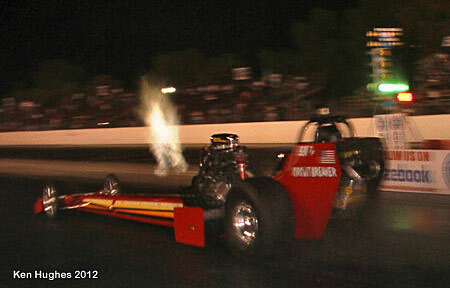 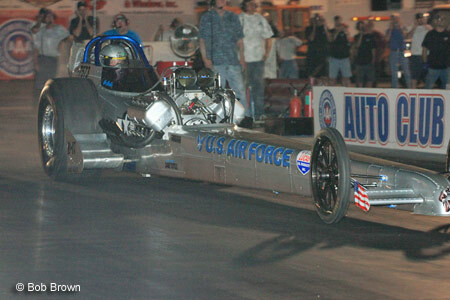 The only other Top Fuel car on the grounds was John Rasmussen testing in Bob Richardson's car for the upcoming CHRR. 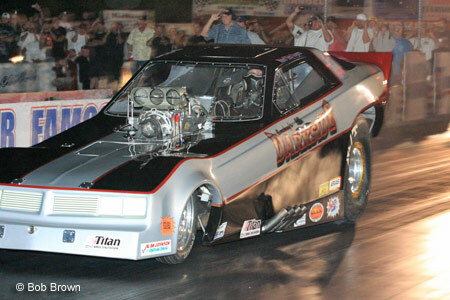 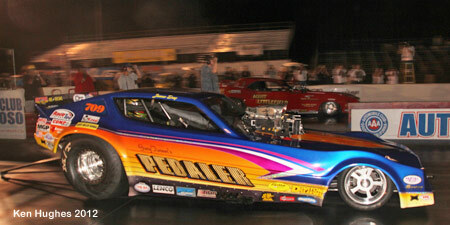 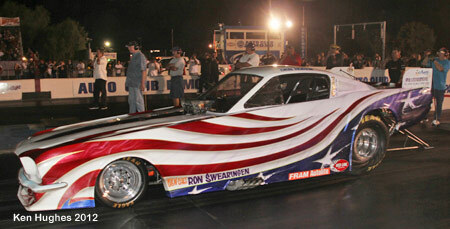 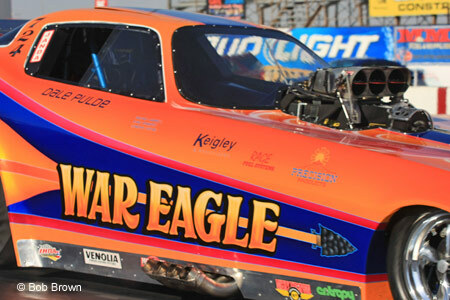 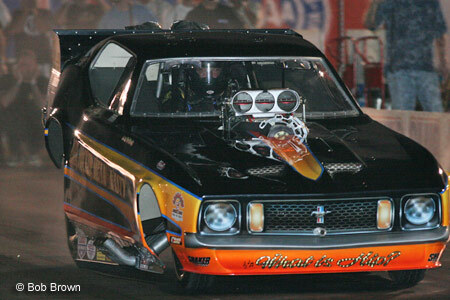 The stars of this Saturday Night Nitro show was dominated by the funny cars. 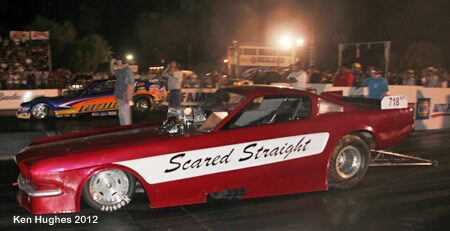 Here are some great shots, in no particular order, of the cars who battled it out for the right to be the final pair.